Laura Nashman is the president and founding director of ‘Spa-la-la®’, a spa music company. Laura has been recording classical, new age, and concept CD’s for over a decade. 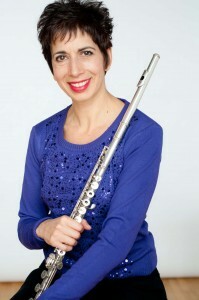 Trained in flute performance at the University of Toronto with flutist, Douglas Stewart, Laura has also studied in master classes with the famous virtuoso, William Bennett, Geoffrey Gilbert, Robert Aitken and Jeanne Baxstresser. With her exquisite tone colour range, Laura paints melodies with her flutes which include alto and Native American flutes. She has 11 CD’s to her credit, including the popular gold CD, “Lullababy” with pianist, John Alonso. As an experienced musician and sound designer, Laura offers superb musical creations. She has an in-depth knowledge of the healing power of sound. Her label, ‘Spa-la-la’, is a collection of CD’s featuring flute with complementary instruments designed for relaxation, healing, meditation, and enjoyment. Traditionally, the sound of the flute has been associated with Pan, the Greek figure who played the reed flute. The mythology related to Pan and his flute bring one into a pastoral fantasy identity with flute music. The legends pertaining to the ‘pied piper’ also lend themselves to the flute’s magical and hypnotic qualities. For years flute music has been a source of inspiration, relaxation and spiritual contemplation. Today, many people use flute music for relaxation, wellness, and healing. The CD’s recorded by Laura Nashman are instruments of inspiration and healing. They offer pure relaxation and melodies that warm the heart and soothe the soul.